Summer Flings is an amateur disc golf league that welcomes players of all skill levels. It's always free to join us and play in our regular season tournaments! If you don't own any discs you can even borrow some of ours. Friends and family are always welcome, and inviting others is encouraged! Though it's recommended that all participants be at least 13 years of age. Every tournament has an optional* Ace Pot wherein willing participants contribute $1 for a chance to win it all by making a goal-in-one! If no one does, the Ace Pot carries over to the next tournament and continues to grow until someone finally makes an "ace"! *Remember, you have to chip in to win! If you make a goal-in-one but didn't contribute to the Ace Pot at the beginning of the match you get a pat on the back and nothing else! The Chuck-it Bucket is an optional* mini-game held before each tournament where willing participants pitch in $1 AND a disc of their own. The discs are jumbled up and pulled at random by the participating players who, throwing from a designated distance (approx. 100ft), attempt to get a goal-in-one. Any who do split the money in the Chuck-it Bucket! Additionally, participants who hit absolutely any part of the basket get to keep the disc they drew! Becoming a member is $20 for an entire season — about the price of a single disc! The membership fees go toward our commemorative custom discs! At the end of every season the League Champ is awarded the opportunity to design a disc golf disc of their choosing — and all members get one! After you have played and scored 5 rounds in league play, your scores will be averaged in relation to par and the resulting number is your handicap. 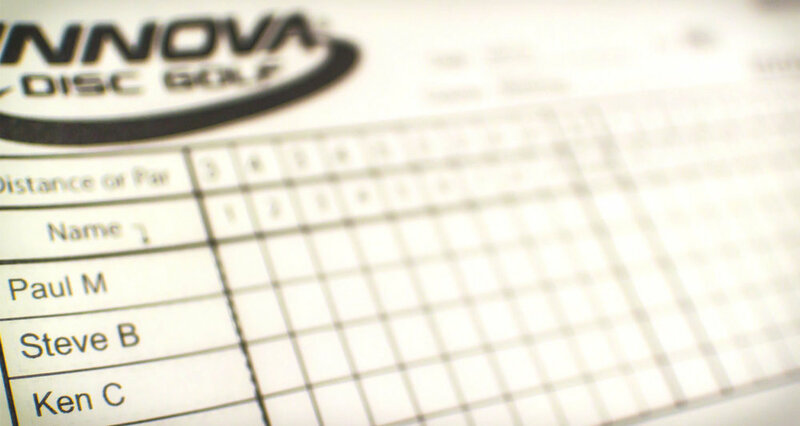 This is used to modify your scorecard so that you can be more competitive with the best players in the league. There are 2 types of handicaps: handicap and handicap+. If your average score is 5 or less you're able to subtract your handicap from your scored round to make your official score. If your average score is 6 or greater, there is 3-stroke penalty added to your score. Points are accumulated over each of the 26 tournaments that make up our regular season with a strong emphasis on winning, high finishes, consistency, and improvement. The player with the most points at the end of the year is the Player of the Year (not to be confused with the League Champion) and others who score highly are given advantages going into the post-season tournaments.